"It is critical that we feel worthy." Today, I understand the truth and power of this word - critical. And I destroyed a lot of painting. The name of the exhibit was "Close to Home." because no one "wanted" it. And today I can see she is also the goddess Lakshmi, pouring golden blessings from her hand. And I can see and feel Hecate dressed in black even though I don't know much about her. As the asteroid Hecate she is a dark moon goddess who stands at the crossroads between the visible and invisible worlds. She can bring the need to live in day to day reality home to us. If I had not reacted in fear to the strength she exhibited, I could have learned from the forms that I intuitively painted and felt worthy of the mirror they offered to me. Ah, now a memory arises. I painted that painting from an old photo I saw of a local woman standing in her garden. I was trying to remember myself through her. I have been able to hear my sister Flora and understand her work as my heart opens, no longer afraid of our differences or the certainty she shares in her process. I have remembered who I am through the circle of Awakening Women Institute, led by Chameli Ardagh, no longer afraid of the multitude of forms and gifts woman embodies. It is no mistake that I have come home again, returning to a home studio after three years of being in a group space at River District Arts. 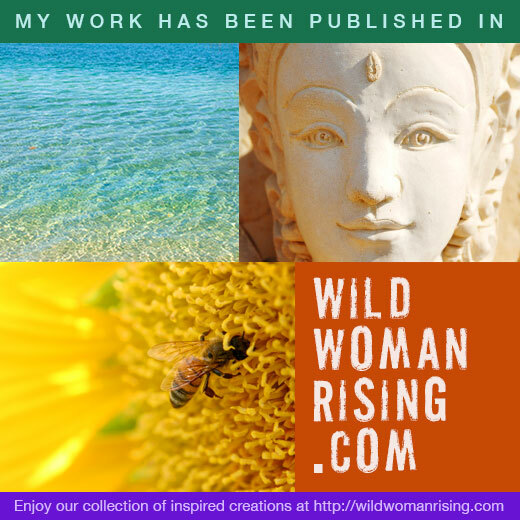 And it is no mistake that I am writing this morning for Wild Woman Rising, a piece in response to Mel Shapcott's question/prompt - where is your heart? My heart is close to home. And home is family and a few friends, mountains and woods and rivers. I am closer to home every day, in my own way, in this body. In every moment that the gap closes, I am simply home. Period. Present. In this awareness of the flow of life and death, I am home as life itself, as Woman. It is critical that we feel worthy of our way of being and creating and living. May you be home in your way. There is work to be done and celebrated.